On Monday, September 25, the Chicago theater community will come together to fight racism in a special event co-produced by Black Ensemble Theater and Steppenwolf Theatre Company. This special one-night-event, Chicago’s Theater Community Coming Together to Fight the Ism’s "Highlighting Racism," will begin with a presentation at 6:00pm followed by a reception and networking at approximately 7:00 p.m. at the Black Ensemble Theater Cultural Center, 4450 N. Clark Street. The event is free and open to the public. This one-night-only event will focus on a positive experience to explore racism and and other oppressions, and includes performances and presentations from area companies including Teatro Vista, About Face Theatre, Black Ensemble Theater, Her Story Theatre and Firebrand Theatre. Featured speakers include Tyronne Stoudemire (‎Vice President Global Diversity and Inclusion, Hyatt Corporation) and Angelique Powers (President, The Field Foundation and Co-Founder of Enrich). There will be an opportunity for audience participation in this transformative evening. The evening was motivated by recent discussion within the Chicago theater community regarding racism and offers the entire community, including artists, administrators and critics the opportunity to come together and communicate positively and productively. “This is a necessary evening of education, understanding and coming together,” comments Black Ensemble Founder and CEO Jackie Taylor. “We must understand the systemic process of racism and oppression — what is it and how can we remove it from our community? This is a way to bring us together so that we can begin the healing process that is so necessary in a racist and oppressive society. Tickets for this event are FREE and open to the public. Tickets must be reserved. To reserve tickets go to blackensembletheater.org/fighttheisms. Or visit the Black Ensemble Theater website at www.blackensemble.org. On November 18, 2011, The Black Ensemble Theater Cultural Center opened and is able to accommodate larger-scale productions, bigger audiences and a wider range of educational programming. The new facility includes amenities such as a 299-seat main stage theater (double the capacity of the original venue); 14 offices, classroom space, rehearsal hall, dance studio, scene shop, costume shop, and wardrobe rooms; seven dressing rooms; rehearsal room for musicians; front lobby space with concession areas; and an indoor parking garage. The completion of a 150-seat theater, which will serve as an experimental stage for the work of the Black Playwright Initiative (BPI), with construction by General Contractor Norcon Inc., is expected in 2018. The mission of the Black Ensemble Theater Company is to eradicate racism and its devastating effects upon society through the theater arts. For more information on the Black Ensemble Theater Company, please visit www.BlackEnsembleTheater.org or call 773-769-4451. Steppenwolf Theatre Company is the nation's premier ensemble theater. Formed by a collective of actors in 1976, the ensemble has grown to 49 members who represent a remarkable cross-section of actors, directors and playwrights. Thrilling and powerful productions from Balm in Gilead to August: Osage County-and accolades that include the National Medal of Arts and 12 Tony Awards-have made the theater legendary. 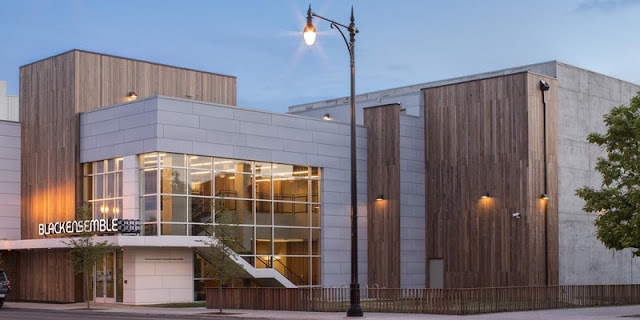 Steppenwolf produces hundreds of performances and events annually in its three spaces: the 515-seat Downstairs Theatre, the 299-seat Upstairs Theatre and the 80-seat 1700 Theatre. Artistic programing includes a seven-play season; a two-play Steppenwolf for Young Adults season; Visiting Company engagements; and LookOut, a multi-genre performances series. Education initiatives include the nationally recognized work of Steppenwolf for Young Adults, which engages 15,000 participants annually from Chicago's diverse communities; the esteemed School at Steppenwolf; and Professional Leadership Programs for arts administration training. While firmly grounded in the Chicago community, nearly 40 original Steppenwolf productions have enjoyed success both nationally and internationally, including Broadway, Off-Broadway, London, Sydney, Galway and Dublin. Anna D. Shapiro is the Artistic Director and David Schmitz is the Executive Director. Eric Lefkofsky is Chair of Steppenwolf's Board of Trustees. For additional information, steppenwolf.org, facebook.com/steppenwolftheatre, twitter.com/steppenwolfthtr and instagram.com/steppenwolfthtr.